Welcome to the annual meeting of the Sports Journalists’ Association of Great Britain. First, can I reassure you that I have spoken to Mark Steel, and he has agreed to leave the jokes to me today. The past year, the Association’s 65th but my first as SJA chairman, might have had all the signs of “after the Lord Mayor’s Show”, following the highs of 2012’s London Olympics. But for the SJA, your committee has been busier than ever and, I am pleased to report, has helped to secure the Association’s future. It is no secret that, in the midst of the worst economic downturn in history, the SJA faced some difficult times in trying to replace long-term financial partners. Today, I am delighted to outline to you a situation in which not only are the SJA’s day-to-day activities under-pinned and improved, but we can look forward to greater activities and benefits for our members. We now have major partners who will be at our sides for our annual Sports Awards and Sports Journalism Awards through until 2016: The National Lottery and BT Sport. After a one-off deal in 2012, The National Lottery returned as title sponsors of our Sports Awards at the Tower of London, expertly compered by Jim Rosenthal last December, when we named Andy Murray, Christine Ohuruogu and the British and Irish Lions as our Sportsman, Sportswoman and Team of the Year. 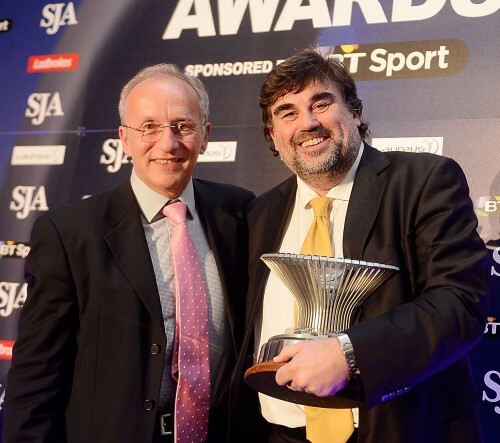 We announced BT Sport as title sponsors of the British Sports Journalism Awards last month, when John Inverdale and Sybil Ruscoe presided over an evening in which the Daily Mail’s Martin Samuel, Getty Images’s Bryn Lennon and BBC Radio’s Alison Mitchell were among our major award-winners. I am also glad to report that both Ladbrokes and Laureus have signed new deals to continue to work with the Association. Because while the SJA’s membership numbers continue to grow and thrive, it would not be possible to stage the activities we have without significant subsidy through sponsorship fees. • A Race Day at York on May 15, with corporate hospitality provided to members at one-quarter of the cost. • An international media reception at the Glasgow Commonwealth Games, staged for colleagues visiting from around the world to meet SJA members. • The return of the popular SJA Yearbook in hard-copy format, as well as being available digitally. None of that would have been possible without many hours of work from your committee, and also the help of our sponsorship agents, Red Torch. It is four years since we began the search for an agency that could help to deliver the sort of deals which we are beginning to see flourish now, and I am optimistic that we will be able to announce other valuable membership benefits in due course. 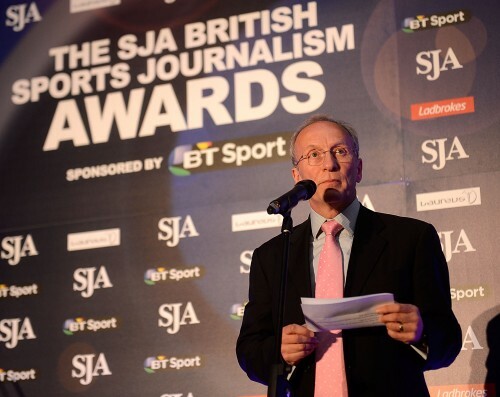 It is worth re-stating that, at last month’s Sports Journalism Awards, as with the Sports Awards in December, the ticket prices for members have been kept at half the cost price for the past four years, a considerable benefit for the membership. WHEN I WAS ELECTED AS CHAIRMAN 12 months ago, I did so knowing that we would have a much-changed team. Janine Self has come in as my deputy, Sarah Juggins has taken over the onerous duties as treasurer, and we have had two very capable new chairs of the writing and photo judges for the Sports Journalism Awards in Tom Clarke and Brendan Monks. After 18 years’ sterling service to this Association, Bill Colwill today steps down from the committee as membership secretary. Bill’s hard work over the years has already seen us present him with all the various awards and decorations that the Association can offer, but we hope to mark his retirement with a quiet lunch with a few friends near his home some time over the summer. 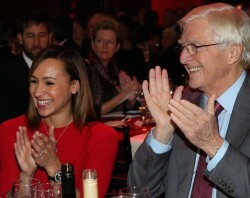 We are also entering the final year of the presidency of Sir Michael Parkinson. The behind-the-scenes impact and influence that Sir Michael has had for the Association in his eight years as President are probably only properly known to a handful of people in this room. But it is fair to say that when the SJA was at the bottom of a financial trough a couple of years ago, it was Sir Michael who used his contacts and charm to find us a sponsor in our hour of need. Sir Michael has not enjoyed the best of health recently, but he hopes that he will play a significant role in our activities in the next 12 months, when the prostate cancer campaign of which he is a patron, Men United, will be the Association’s nominated charity at our December 2014 and March 2015 award ceremonies. INCREASINGLY, THE SPORTS JOURNALISTS’ ASSOCIATION is called upon for its views and help on media matters. Only last month, I was delighted when the Minister for Sport, Helen Grant, invited our Association to organise an event in which she might address sports journalists. I hope this may be because she had been impressed by the carefully considered and well-informed paper on women in sports and sports media, written by Janine Self, which we submitted to the parliamentary sub-committee on Culture, Media and Sport last autumn, and where Sarah Juggins capably provided evidence. Perhaps if we do manage to get a members’ lunch with the Minister, we will be able to discuss with her the state of our industry, at a time when sports desk staffs are being cut to the bone, there have been further mergers and 24/7 operations announced, while local newspapers face unreasonable banning orders at some football clubs and others try to charge fees for interviews and press box access. These are not always areas in which the SJA can intercede directly, but in more than one case of a regional newspaper ban last year, we know that the national publicity which the Association delivered, largely through our busy website, helped to persuade the football club management to step back and reconsider their position. Most of us began our careers on a local paper, and it is my keen desire to see the SJA become increasingly relevant and essential for our hard-pressed colleagues working in the regional media. 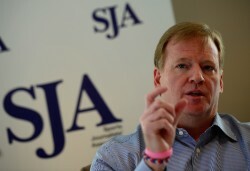 I was delighted, therefore, that there were a couple of SJA members who are local newspaper reporters among those who joined us for lunch last week with boxer George Groves, the latest highly successful occasion in the past year where our high-profile guests have included one of international sports most powerful figures in NFL Commissioner Roger Goodell, former All Black rugby captain Sean Fitzpatrick, Michael Vaughan, the England cricket captain-turned-broadcaster, and an outstanding masterclass, staged at the BT Tower, with Twitter UK director Lewis Wiltshire. All of these events were organised for you by committee stalwart Mary Fitzhenry, assisted by Janine Self. Your Association now has 24,000 followers on Twitter – up by one-third on last year – which with links to the content on the website provided by the likes of Anton Rippon and Norman Giller, helps to promote the SJA to a global audience daily and, more importantly, helps to keep us in touch with our members, who also receive regular bulletins by email. That Twitter following also demonstrates that, more than ever, there is a keen interest and need for an organisation such as ours. Together with your committee, I shall be working to underline that in the coming months. Finally, our committee is well aware of how much the SJA means to its members. Please be assured, young or old, currently employed or retired, that we appreciate all views and ideas on how to make our organisation better. Please do not hesitate in making your contribution to the SJA cause.